Anyone up for snorkeling above a volcano? If the answer is yes, you are not alone. Snorkeling at Champagne Reef, an area known for its volcanic activity, happens to be on "bucket lists" world wide. 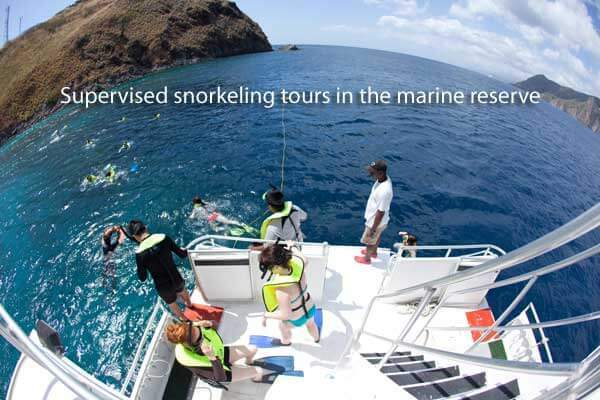 And no surprise since the site is ranked as one of the top snorkeling venues in the world. Dominica is actually home to nine active volcanoes, but at Champagne Reef, you get to experience the geothermal activity by snorkeling through it! At the site, Dominica’s subterranean geothermal activity actually pushes up through tiny cracks on the sea floor. This fills the water with small, warm bubbles, hence giving the reef its name. Luckily it is not just humans who find swimming in a giant bottle of bubbly to their taste. This same activity and venting attracts some very special creatures as well. This is a great spot to look for sea horses, frog fish, parrot fish and even Flying Gurnards among the colorful gardens of hard and soft coral and sponges. See for yourself what a snorkeling excursion with Dive Dominica can be like by watching this video from Roger Roth. If you are coming from a cruise ship, you will board a powered catamaran two minutes walk from where the Cruise Ship docks. Once aboard, the Captain will give the safety briefing to the snorkel group and safety waivers must be filled out by each snorkeler. Snorkel equipment will be distributed and fitted by each person. Then, you will cruise south toward the Soufriere Scottshead Marine Reserve along the west coast of Dominica for approximately fifteen minutes. This coastline offers dramatic views of lush mountains soaring to the clouds and scattered quaint fishing villages sleepily sitting on the ocean’s edge. Various species of marine birds circle the blue skies and occasionally, a sea turtle pops up for a quick peak of the boat. Once in the Reserve, the boat moors at the Northern tip, at Champagne Reef. The snorkel guide gives a briefing of the site and the do’s and don’t’s before the real fun begins. Everyone gets into the water and the snorkeling guides take the group on a guided tour of the reef, starting in a sand bed and working towards the reef. They will point out the rare things to see and provide the names of species of fish and coral life. The reef drops to about 50 feet to the West, giving a dramatic plunging effect of marine life. The tour ends close to shore atop vents that pump hot fresh water from the sea bed, as bubbles emerge from the water, making you feel as though you are swimming through a glass of Champagne. A second snorkel site that can be visited is called L’Abyme - meaning deep – due to the sharp vertical walls cloaked with coral, plunging into the caldera, offering glimpses of the deep blue depths below. Due to the depths, it is possible to see tuna, jacks, rays and other pelagic life. Marine life in this volcanic crater is phenomenal, and sighting sea-horses and tiny shrimp is common. Once off the wall, barrel tube sponges and anemones wrap the ocean’s floor, in between sand patches that signal the end of your tour. It is also possible for snorkelers to join their diving companions on the dive boat, space permitted. The cost is $37.20 per person per trip, including equipment, taxes and marine park fees. Not all of the dive sites the dive boats visit are appropriate for snorkeling, however several have reef terraces full of life in as little as 15' - 25'.